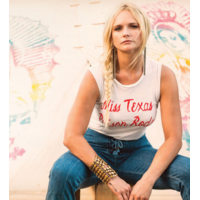 Miranda Leigh Lambert (born November 10, 1983 in Longview, Texas) is an American country music artist who gained fame as a finalist on the 2003 season of Nashville Star, where she finished in third place and later signed to Epic Records. Lambert made her debut with the release of "Me and Charlie Talking", the first single from her 2005 debut album Kerosene. This album, which was certified Platinum in the United States, also produced the singles "Bring Me Down", "Kerosene", and "New Strings". All four singles were Top 40 hits on the Billboard Hot Country Songs charts. After the closure of Epic's Nashville division, Lambert was transferred to Columbia Records Nashville for her second album, Crazy Ex-Girlfriend, which was released in early 2007. Although the title track failed to make top 40, the next three singles ("Famous in a Small Town", "Gunpowder & Lead", and "More Like Her") were all Top 20 hits, with "Gunpowder & Lead" becoming her first Top 10 country hit in July 2008. Lambert's third album, Revolution, was released in September 2009. Four singles have been released from the album, including Lambert's Number One hit in "The House That Built Me," which spent four weeks at the top of the chart.